I need your advice. Really. Yesterday, I and a few members of my team confronted the challenge of leading all of the curriculum specialists in the Jordan School District in a discussion centered on learning how to (1) better integrate Google Docs into a number of educational scenarios, while (2) learning how to use Google Docs in and of itself. Picture sixty different people simultaneously editing this document after minimal training. While forty undoubtedly thrive with the new possibilities of global collaboration, there still exist that twenty that can do little more than shake their heads in misunderstanding. Throughout the entire experience, it was evident that while roughly two-thirds of the group easily understood how to use Google Docs (with minimal training on where to click), there was an unrelenting third of the group that simply didn't know how to function. 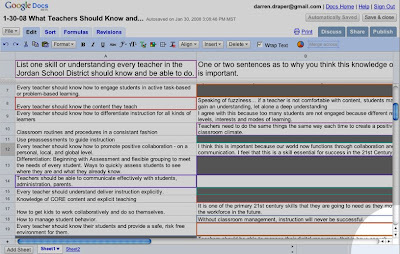 In other words, roughly one-third of our group - and mind you, these are "Curriculum Specialists"; the teachers in the know, the leaders, the ones that you actually want up to bat in the ninth - I repeat: roughly one-third of these specialists actually needed step by step, click-here-for-this, there-for-that instruction. In our second session of OpenPD last night we discussed why we should use social software in our teaching. During the discussion Dennis Richards, a Superintendent from Massachusetts, brought up the point that it is difficult to formulate policy governing the use of online tools because the tools are changing so rapidly. Jamie Gustin and Glen Moses - also educational administrators - agreed with Dennis. As it turned out, we concluded that at times it is best to simply provide a blanket statement, blanket policy, [blanket training] - much as our district has done with its Acceptable Use Policies. In other words, if we're able to provide a policy, for example, that covers all of our bases in one flail swoop, then all will work out in the end. This policy references the use of electronic information resources made available to employees by Jordan School District. These resources include, but are not limited to, voice mail, electronic mail, the Internet, and other network files or accounts provided to employees. Did you notice the wording? Instead of listing every online technology imaginable (i.e. online video, audio, podcasts, wikis, blogs, voicethreads...) we are covered with the encompassing term "the Internet". It seems that in addressing these needs generally, the specifics take care of themselves. Throughout our OpenPD sessions, we've had excellent discussions about how various social software tools can be used in a classroom setting, thus enhancing a teacher's curriculum. We've also deliberated over why such tools should be used and to what extent. In short, we've spent far more time in discussing the pedagogy behind the tools rather than simply addressing how to use the tools. With that in mind, I think we've been able to reach the wider audience - as most people these days are simply able to figure out how to use the tools with minimal training (see scenario 1) and they really can't get such a discussion about the intricacies of pedagogy anywhere else. But is reaching the wider audience really best practice? In asking this question, I'm reminded of that unrelenting third that simply can't function - or appear to not be able to understand - without step-by-step tutelage. For upon completion of our wonderful discussions about the how and the why behind the tools, I was left with a third of my class last night, struggling with how to edit their own wiki pages. Simply put, the twenty to thirty minutes of push-button instruction that we had dedicated in our class was simply not enough (click here to edit the page; no, you have to sign in first; yes, you have to sign in every time you want to edit; yes, this page is even available to you from home). To encourage constructivist learning is important, indeed, but that which is intuitive to you and to me may not be so instinctual to that unrelenting third. Wherein lies the balance between teaching the hows and the whys behind the tools and teaching the tools themselves? How do we teach this "unrelenting third", whom I love and honestly hope to help, without holding the rest behind? How do we provide differentiated instruction in our teacher-centric OpenPD environment? I understand fully that shift has happened in our world. I'm just afraid that it's already time for a shift in the way we approach OpenPD. Robin Ellis and I discussed 21st Century professional development today in the first breakout session at EduCon 2.0. In a refreshing reversal of roles, Robin led the discussion in person while I participated remotely. From a technical standpoint, there were a few bandwidth issues - but all in all, the session was a very enjoyable and enlightening conversation. What keeps teachers from adapting to change? What keeps teachers from actively participating in Professional Development? What is Open Professional Development? What can we do to promote conversations in our communities for change? While we didn't address question five as much as I had originally hoped, I plan to elaborate on this idea further as I see tremendous potential for future teacher development in an open but organized setting. Exactly what open means, though, still eludes me in its entirely. More on that to come - I know you can hardly wait. To say I was pleased by the numbers participating would be an understatement. The room was apparently full (with folks happily sitting on the floor) and the Ustream numbers topped 100. This is only significant in the fact that I'm happy to see conversations about current and future Professional Development practices taking place. I think that if we truly want to change the way our students are taught, then there's no discussion more important than one centered on how we teach our teachers. 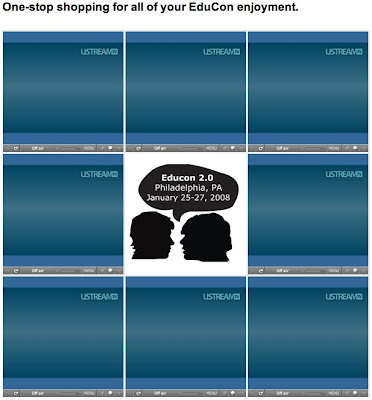 If you're interested in viewing the conversation (recorded through Ustream), drop by our wiki. There, you'll also see a link to the chat archive and our slides used during the presentation (also below). I don't know if this will really work (and won't until they begin broadcasting), but I thought that if I can't have a cheesesteak, then I'd might as well improve the experience for those of us left behind. 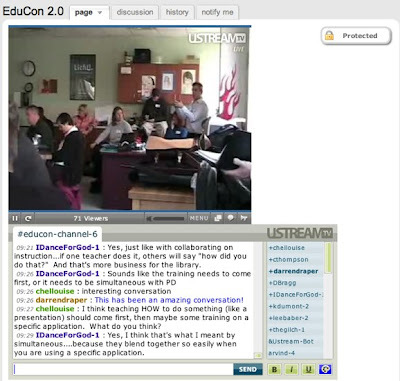 Introducing EduConTV: Your one-stop shop for the virtual EduCon experience. Thanks for the inspiration, Dembo. We'll cross our fingers that nothing explodes. In transforming the world into “a series of representations, including field notes, interviews, conversations, photographs, recordings, and memos to the self” (p. 3) the research can then better define him or herself in relation to the world, further defining the world in the process. I find this entire process to be fascinating. Another idea that I find to be as interesting in its ramifications as it is difficult in its application is openness inherent within qualitative research. While a part of me is troubled by “the open, emergent nature of qualitative inquiry” – and hence its innate “lack of standardization” (Glesne, p. 19) – another part of me screams with joy in reaction to this implied freedom. To be able to consistently “push the envelope” offers tremendous promise for I deem the ever-changing nature of such research design to be extremely refreshing. To be clear, I am particularly drawn toward two particular strands within the overarching concept of qualitative research: Action research and Postmodernism. I am intrigued by the possibilities that action research may hold because it “has experienced popularity again, particularly in education, as a way to improve practice” (Glesne, 2006, p. 17). 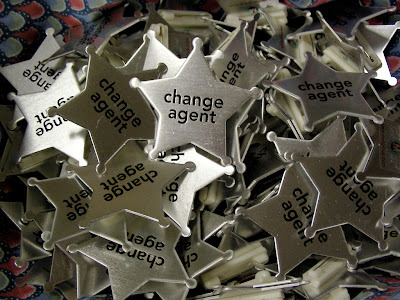 As one that hopes to assume an effective role as a change agent (Rogers, 2003, p. 27) in education, I see action research – with such a focus on improvement – as a particularly promising paradigm. Postmodernism, on the other hand, has proven to be equally compelling – particularly in how postmodernism is “marked by globalization, the spread of information technologies, and the fragmentation of nation-states” (Glesne, p. 18). My current professional position as a Technology Curriculum Specialist in the Jordan School District – and our current emphasis on global collaboration and other 21st Century skills – has led me to further inclinations to conduct research within this exciting field. Nonetheless, I don’t see postmodernism (or at least Glesne’s representation of it) as perfect. Particularly, I actually do think that there are many universal truths to be discovered – in spite of Delamont’s (2002, p. 157) claim to the contrary. Even though I can empathize with the postmodern doubt in the ability of Western science to solve all of the world’s problems, absolute truth – as I see it – can be discovered in time and through scientific and personal inquiry. In conclusion, I look forward to learning more about qualitative research and hope to discover different ways that it can be used throughout my career. Denzin, N. K., & Lincoln, Y. S. (2005). Introduction: The discipline and practice of qualitative research. In N.K. Denzin & Y. S. Lincoln (Eds. ), The SAGE handbook of qualitative research (3rd ed., pp. 1-32). Thousand Oaks: Sage Publications. Glesne, C. (2006). Becoming qualitative researchers: An introduction (3rd ed.). Boston: Pearson Education, Inc.
Mark my words: The EduCon/EduBloggerCon/Unconference conference model is the absolute future of QUALITY educational conferences. That said, I'd like to invite you to join me next weekend at EduCon 2.0. FORTUNATELY, there will be nearly two hundred top-notch educators from around the world attending the event. Yep, these are folks that actually get it. Check out this list of attendees. UNFORTUNATELY, not everyone attending has signed the list (myself included). FORTUNATELY, it's a wiki. [Adding myself to the list]. Now I'm on the list. UNFORTUNATELY, I had to admit that I probably won't make it there in person. I mentioned to my supervisor that I would be co-facilitating one the discussions - and pleeeease can the district help me get there. I was answered with a very politically correct "Fu-gidda-boud-it, Draper." FORTUNATELY, there's Skype. And Ustream. And our world is flat. Remember? UNFORTUNATELY, sometimes even the best made plans turn into the worst nightmares. FORTUNATELY, I'll be co-presenting with the very capable Robin Ellis. I also figure that she'll have a room full of extremely capable ed-techies, anxious to discuss OpenPD, to come to the rescue if need be. Besides, I also see now that our session be broadcast on EduCon TV - Channel 6. Does it get any better than this? 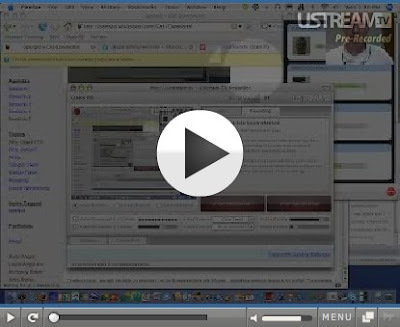 UNFORTUNATELY, eight simultaneous Ustream broadcasts from the same pipe could cause issues. FORTUNATELY, Chris Lehmann's running the show. We're definitely in good hands! To conclude, we'd love to have you join us (either in person or virtually) in our discussion about current and future professional development practices from 10-11:30am EST on Saturday, January 26. This morning, I had the opportunity to participate with Karl Fisch, Anne Smith, Maura Moritz, and their classes in a discussion about design - centered upon principles introduced by Dan Pink in his book A Whole New Mind. The experience was very worthwhile and an excellent example of how much technology can help to make in-class discussion an engaging process. Put it this way: I know I never paid this much attention when I was taking English classes in high school. 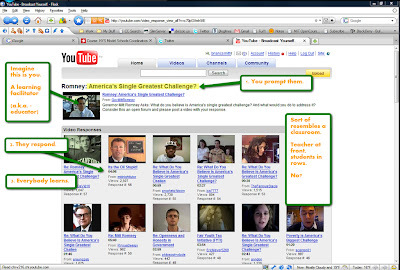 Those kids were engaged, actively thinking and participating in the discussions - both online and face to face. A wiki to bring all participants together. This was also used to understand who was participating, and when. 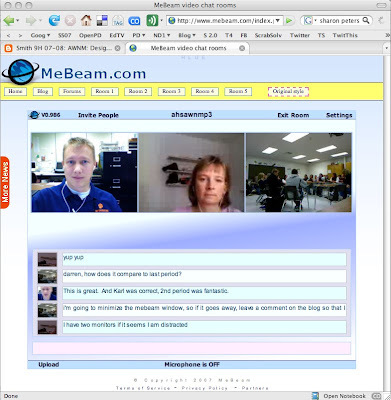 A MeBeam room for each of the different classes (see screenshot above). This was used to connect us all together during the discussion. They were able to see me (and the other off-site participants) while I was able to see (and hear) them. A blog for each class (with posts corresponding to each class discussion). I participated with two different classes in two different discussions - Period 2 here and Period 3 here. The discussions are found within the comments of each of these posts. Keep in mind that I was able to hear them. This effort obviously took a significant amount of time to prepare. I would estimate that Karl alone has spent over 20 hours putting this together - doubtless one of the reasons I've never seen anything similar and of this scale before. Nevertheless, I think that such efforts were well worth it as I'm sure this is an experience that the students will not soon forget. Well done Arapahoe High School - raising the bar ever higher. What you’re declaring when you choose to delete or ignore a very large number of e-mail messages after falling behind in reading and responding to them. This often includes sending a boilerplate message explaining that old messages will never receive a personal, specific response. Although the Stanford law professor Lawrence Lessig is often credited with coining this term, at best he can be said to have popularized it. 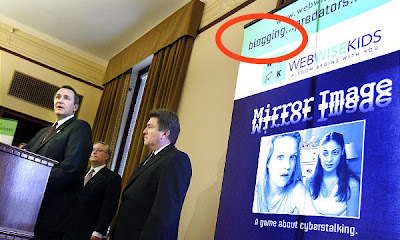 Its first use was in 2002, two years before Mr. Lessig publicly declared his own e-mail bankruptcy. Personally, I've never had the need to declare e-mail bankruptcy. In spite of the dozens of legitimate email messages I receive daily, I've managed to successfully stay on top of the onslaught (granted, I'm no Leo Laporte). Besides, what's so hard about seeing the name of the sender and then promptly pressing the *delete* key? Twitter, though is different. You can say that again! Twitter, though, is different. Sure Twitter is like e-mail. But there's no *delete* key, and at times it's nearly impossible to just. keep. up. I now declare Twitter bankruptcy. Finally, I think I'll stick loosely with the Hutterite philosophy regarding community size: 150's the magic number. Hey, if it's good enough for Gladwell, it's good enough for me. Because let's face it. What good is a conversation if you're not able to follow it? Sue Waters from the Mobile Technology in TAFE blog presented me with the Bloggers Who Create Community Award! The purpose of this award is to show gratitude to bloggers whose focus is on building communities. Lets be honest — giving Darren an award, with any type of rule attached, is a frightening thought because he is well known for changing rules and is incredible funny. But those who know him well would agree he totally deserve this award for all his edublogger community support and his work with the Global Open Professional Development - Social Software in the Classroom. I am humbled by Darren’s incredible diplomatic skills in the global community. Sue, you are one that really deserves the award. The example you have set for teachers throughout Australia and the rest of the world is highly commendable. Therefore, thank YOU for making our community far more worthwhile. Laura - New York, United States? At which point I lose interest (or time, rather) in following the trail. Nevertheless, in perusing the list alone you're able to glimpse how very small our world has become - and how different community is today from yesterday. Yesterday, community was generally local. Today, it's global. In order to conform to rules established by previous award recipients, I will now list three bloggers (among many) that I have found to be tremendous in their abilities to build community. I doubt that anyone would argue with me when I say that Steve Hargadon has done more to encourage and enable community among educators - or at least online community in the form of social networking - than any other person. The creator of Classroom 2.0 and a number of other educational social networks, I would be surprised if Steve's full name isn't Steve Community Hargadon. Another new policy: anyone who takes the time to comment on my blog, I automatically follow in twitter. It only seems fair. Durff is absolutely amazing. Sincere and genuine, I'm so appreciative of how well she is able to include others in learning throughout the communities with which she participates. I've said it before and I'll say it again: We need to clone Durff and place several copies in every school around the world. Now, it appears that one of the purposes in passing along this award is to thank others - that have been so effective in promoting community - for their efforts. Thus, I would be remiss if I didn't continue to list a few more bloggers - in no particular order - for whom I am grateful. Robin Ellis - Thanks, Robin, for all of the time you've spent to further the cause. For those of you that don't already know, Robin is continually promulgating community throughout her many circles. Patrick Higgins - Thanks for promoting community among your teachers in New Jersey as well as throughout the world (we'll boost your new Technorati ranking just yet). Jennifer Jones - Thanks for the hilarious tweets. I'm actually kind of glad that you caved. +10pts. Suzanne - Thanks for your efforts in promoting community among those at EduBloggerWorld. Stephanie Sandifer - Thanks for being such a great example for edubloggers, teachers, and principals alike - in Texas and throughout the blogosphere. Chris Brogan - I've got to say thanks, personally, for your Google Reader shared items - in addition to thanking you for taking the time to so effectively promote community. I don't know how you find it all, but the items you share are fantastic. I just watched this again thanks to Christopher Sessum's recent post. Michael Wesch is my hero. If you are a teacher, administrator, or technology specialist that would like to learn more about the many free, online tools that can be used to enhance your teaching, then consider yourself personally invited to join us for round 2 of Open Professional Development - Social Software in the Classroom. Round 1 was such a success that we'd love to have you learn with us and look forward to an exciting, open, and collaborative experience. When - Class will be held once a week (for five weeks) beginning Wednesday, January 23rd. Class sessions will be held from 4:30-7:15 p.m. Mountain Daylight Time. Click here to translate these times to your time zone. Skype - If you don't have a Skype account, you will want to create one ahead of time (free), as Robin Ellis will be moderating a Skype chatroom throughout the class. To join in, send her a quick message through Skype: robin.ellis1. We recommend you use a headset for the conversations throughout the course, using one will minimize the echoing effect you may experience. Class Wiki - Our class wiki (with schedule and future participant portfolios) will be available here: http://openpd.wikispaces.com/. To join in on the action, please join our class wiki. Attendance - For teachers not receiving in-service credit, perfect attendance is not required. Come One, Come All - While this class is intended to help newbies learn more about the educational uses of Web 2.0 technologies, experienced users are equally welcome (and appreciated, as the sum of our knowledge is what truly makes these new technologies so appealing). If you are a teacher in the Jordan School District, you may also register here to receive JSD lane change credit. Hopefully, I'll see you soon! Stephen Downes has created an informative report card detailing "the predictions from the 2007 eLearn Magazine's annual round-up, and what actually happened." I have decided to take Stephen's findings one step further. The following "grades" have come from Stephen's post and the blogs have mostly been identified (hopefully accurately) using a simple Google search: 'elliot masie blog', for example, reveals several online works created by Elliot. Now, using the 4.0 grade scale (generally standard in the United States), I've calculated the collective averages of bloggers versus non-bloggers - and if I've recorded any of the above entries erroneously, please let me know and I'll adjust the numbers below. In spite of his efforts to the contrary, Stephen Downes might be biased in his grading. 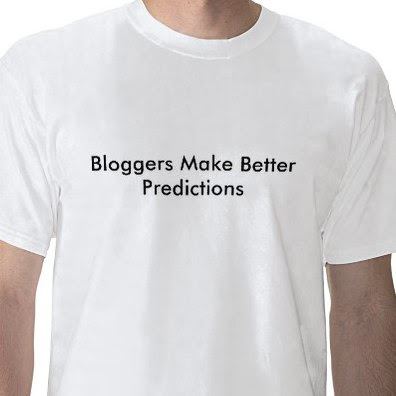 Bloggers might be more effective in making accurate predictions about educational technologies. Blogging just might make you think clearer, with a greater awareness of current events and trends. I have just found several new blogs to add to the reader. So what are your conclusions? Yesterday I discovered that Mitt Romney has been asking, "What do you believe is America's single greatest challenge?" I responded to Mitt's query with Pay Attention even though I think many of our nation's education problems stem from the weakening of the family unit. Now what Brian may not have noticed was that Governor Romney has been moderating the video responses that his plea has attracted: another useful feature in any 21st Century school! "What's that, Tommy Talks-A-Lot? I can't hear you today. I'm sorry, but it appears that what you've been saying has been blocked by my filter." I can hear the teachers lining up for this feature already!